With legislative leaders and autism community advocates looking on, Gov. 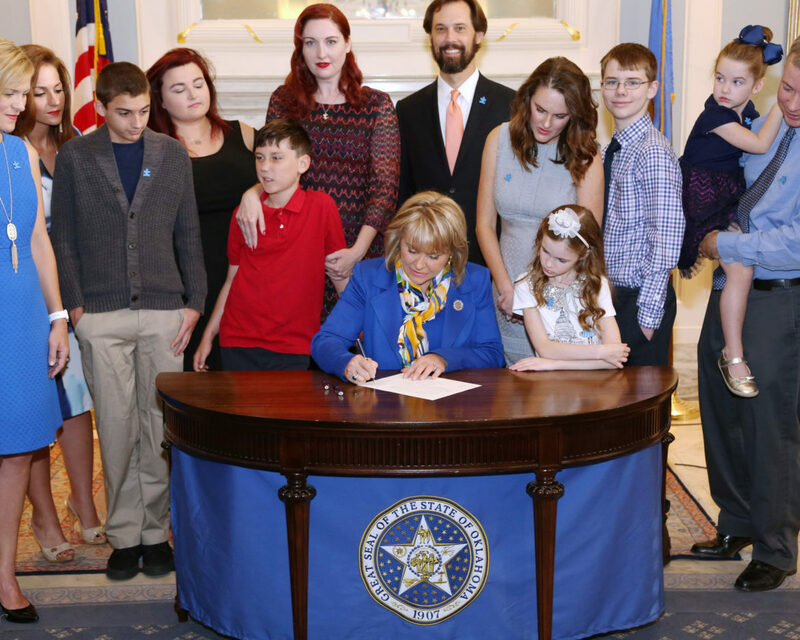 Mary Fallin signed a bill in May last year adding treatment of the disorder to Oklahoma's list of mandated health-plan benefits. Some health groups are concerned that proposed laws this year could lead to fewer plans covering that and other types of medical care. The fate of health coverage for thousands of Oklahomans continues to hang in the balance despite the failure of Republicans to repeal and replace the Affordable Care Act. GOP leaders pulled their health-care proposal Friday after it was clear there were not enough votes in the Republican-controlled House to pass the bill. That means, as Speaker Paul Ryan put it, Obamacare will be the “law of the land” for the foreseeable future. Even though the federal law will remain intact for the time being, state policymakers are exploring moves that could affect health care for hundreds of thousands of people across Oklahoma, by loosening what types of coverage insurers are required to provide. Two bills proposed during this year’s legislative session would allow in-state or out-of-state insurers to offer plans without coverage requirements that lawmakers have added over the years. Also, under Obamacare or a proposed replacement, U.S. officials could loosen federally required benefits using administrative rule changes, and the state could request a waiver of federal mandates. Proponents say these changes could drive down premiums and encourage competition in a market that includes only one insurer on the federal health-care marketplace: Blue Cross Blue Shield of Oklahoma. This could result in cheaper health insurance, although at the expense of more robust coverage. Health-care leaders, however, warn that allowing insurers to provide scaled-back plans would put many Oklahomans at risk of losing coverage for serious health conditions and burying them in medical debt. Over the past several decades, Oklahoma lawmakers have carved out 28 state-mandated health benefits that insurers must provide for individual, group or health-maintenance-organization plans. The mandates are both broad and specific, including mental health, emergency services, cancer treatment and screenings, autism therapy and testing for birth defects. Before passage of the Affordable Care Act in 2010, these provisions defined what insurers had to cover in Oklahoma. This was also true in other states. Generally, those federal benefits go far beyond what states require. And a federal rule, which the Trump administration could change, attaches each state’s mandates in place before 2012 to the federally required benefits package. Taken together, state and federal mandates require almost 60 categories of coverage that affect more than 365,000 Oklahomans. After most of the Affordable Care Act took effect in early 2014, the number of uninsured Oklahomans fell by nearly 18 percent over two years. A drop in Medicaid enrollment and a jump in the number of uninsured in 2016 are attributed to a pause in automatic Medicaid renewals. The largest share of Oklahomans is covered through self-funded employer or large group plans. A fifth of Oklahomans are enrolled in Medicaid. Source: Oklahoma Secretary of Health and Human Services. Some conservatives and insurers say the mandates have contributed significantly to insurance premium increases. The average premium for a single person on the federal exchange in Oklahoma rose from $277 per month in 2014 to $376 in 2016 before tax credits ($65 and $78 with credits), according to the office of the state health and human services secretary. Deductibles also have risen sharply. They also argue that allowing insurers to determine what their plans will offer and permitting plans to be sold across state lines will ultimately increase competition. Moore sponsored two bills that would allow insurers to ignore certain state-mandated benefits in some cases. House Bill 1712 would allow in-state insurers to offer individual or small-group plans without one or more state-mandated benefits. Senate Bill 478 would allow out-of-state insurers to issue health and accident plans in Oklahoma. HB1712 passed out of committee but failed to meet Thursday’s legislative deadline to clear a floor vote in its chamber of origin. That means the proposal is dead, but could be considered again next year. Meanwhile, SB478 passed the Senate on a 39-4 vote on Thursday and will now go before the House for consideration. Under SB 478, the out-of-state plans would be governed by the other states’ mandates, even if the coverage is less than what’s required in Oklahoma. The bill would also allow in-state providers to offer “comparable” plans to those from out of state that have more flexible standards. The proposal has failed before in the Legislature, including in 2012 when a bill died in conference committee after passing both the House and Senate. Although five states have passed similar laws, no insurers have crossed state lines. The National Academy for State Health Policy attributes this to the high cost of entry into new markets and trouble complying with Obamacare regulations. Moore said allowing insurers to offer plans free of state mandates could reduce premiums by up to 30 percent. Insurers agree that allowing greater flexibility would drive down prices, create more consumer choice and provide an option for those who currently can’t afford coverage. “Mandates contribute to the rising costs of health care, which impacts all Oklahomans who have health insurance and can contribute to the growing number of uninsured citizens,” said Laura Brookins Fleet, executive director of the Oklahoma Association of Health Plans. Health providers and advocacy groups strongly oppose the changes. They say allowing stripped-down plans, even along with more comprehensive options, will leave consumers vulnerable when they need help the most. Jane Nelson, executive director of the Oklahoma Nurses Association, said cheaper plans could appear more attractive at first glance, but consumers might not be aware of the protections they will lose. Coverage of treatment of autism is an example. Less than a year ago, Emily Scott, her son, Jimi, and other autism advocates stood behind Gov. Mary Fallin as she signed House Bill 2962. After years of attempts, the law made Oklahoma the 44th state to require insurers to cover applied behavioral therapy for children with autism. But allowing insurers to offer plans without state-mandated benefits could make the requirement less available and affordable. Scott said she fears insurers will offer some plans without autism coverage, which means plans that include the coverage could be far more expensive because the risk is spread among fewer people. This could be devastating to parents who buy plans excluding autism and then discover their child has the disorder, Scott said. Jason Nelson, who retired as a Republican House member last year, was the lead sponsor of HB 2962. He said he is dismayed that fellow conservatives are pushing a plan that could negate the work that overwhelmingly passed with bipartisan support in 2016. Even though the congressional attempt to repeal and replace the federal health-care law failed, coverage mandates could still be loosened. The Republicans’ original version of a replacement plan, the American Health Care Act, kept Obamacare’s 10 essential health benefits for small-group and individual plans. Those include outpatient care and emergency services, hospitalization, pregnancy, maternity and newborn care, mental health and substance abuse, prescription drugs, rehabilitative and habilitative services and devices, laboratory services, preventive and wellness services and pediatric services. An amendment to the ACA replacement legislation would have removed the federal requirements and allowed states to determine essential health benefits. In that case, if HB 1712 and SB 643 were to pass, insurers could potentially offer plans without having to meet federal or state mandates. Even with Obamacare in place, the U.S. health and human services secretary, now Tom Price, retains broad authority to determine how those categories are implemented or give states more flexibility in how to apply the essential health benefits. Republicans could also try again to pass legislation eliminating the 10 essential benefits. In 2013, when he was in Congress, Price authored an ACA replacement bill that would have done away with the essential benefits. Oklahoma could also seek to have the mandates relaxed under current provisions of the Affordable Care Act. That’s because starting this year, states may seek a special “innovation waiver” that allows them to ignore certain parts of the law. Gov. Mary Fallin and legislators have expressed support for seeking a waiver. A state task force published a report earlier this month with recommendations on the type of waiver the state should seek. The group suggested the state should “re-evaluate and reduce the essential health benefits package” required by Obamacare. The report doesn’t go into specifics, but among its recommendations are retaining preventive and behavioral health services. Oklahoma Hospital Association Vice President Rick Snyder, who was involved with the task force, said he sees some opportunities to adjust the list slightly. Snyder suggested that lawmakers don’t rush into anything. But, highlighting what’s at stake, Oklahoma Insurance Commissioner John Doak announced Friday that Blue Cross and Blue Shield of Oklahoma was “making preparations to withdraw” from the federal exchange. This would leave the state without any carrier offering plans through Obamacare in 2018. Doak said he will work to keep the carrier in the state. He added that state-based solutions, such as passing SB 478 and allowing insurance to be sold across state lines, could give consumers more options. “While Oklahoma has experienced a reduced number of uninsured following the implementation of the ACA, it remains high, and the state continues to struggle with high rates of chronic disease and lack of access to health coverage. “Oklahomans are more likely to have chronic diseases and die at higher rates than most other states. Oklahoma had the fourth highest mortality rate in the nation in 2014 and a rate that was 23 percent higher than the national average. “While Oklahoma’s percentage of uninsured non-elderly adults has decreased over 4 percentage points since the implementation of the ACA (2013 to 2015), Oklahoma’s decrease in the uninsured population is smaller than other comparable states. This phenomenon is likely due in large part to low enrollment in the federally facilitated marketplace (FFM). In fact, Oklahoma only had 31 percent of its eligible population (those with incomes between 100-400 percent of the federal poverty level) purchasing coverage through the FFM in 2016, relative to an average of 43 percent among other states similar to Oklahoma.